^Learn the 10 critical choices necessary for?wholeness and recovery after life's tragedies and disappointments.? ^Blending scientifically-validated psychological truths with spiritual principles, Dr. Beverly Smallwood enables readers to overcome?the unexpected and unthinkable. ?Giving readers a roadmap of 10 major choices, she offers hope that no matter what has happened, going forward, ?we all have the power to choose. ^Through the power of choice readers will be able to move from: Denial to Reality Victimhood to Responsibility Why to How Doubt to Faith Bitterness to Forgiveness Guilt to Self-Forgiveness Depression to Grief Avoidance to Courage Isolation to Connection Powerlessness to Purpose ^? 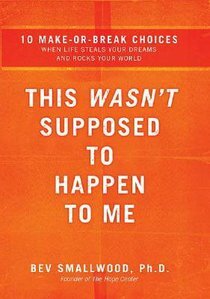 About "This Wasn't Supposed to Happen to Me"